Roentgen was born on March 27, 1845, in Lennep, Prussia (now Remscheid, Germany). In 1864 his college education was interrupted by expulsion from the Utrecht Technical School when he confessed to having drawn a caricature of an unpopular instructor. After a brief enrollment at the University of Utrecht, Holland, he continued at the Swiss Federal Institute of Technology in Zurich, Switzerland, and received a mechanical engineering degree in 1868 and a physics doctorate in 1869. In 1875 Roentgen obtained his first academic appointment, at Hohenheim, subsequently filling teaching posts at Strasbourg, Giessen, and Würzburg. He studied the specific heats of gases, the heat conductivity of crystals, the compressibility of solids and liquids, and the production of electricity in crystals by heat and pressure. 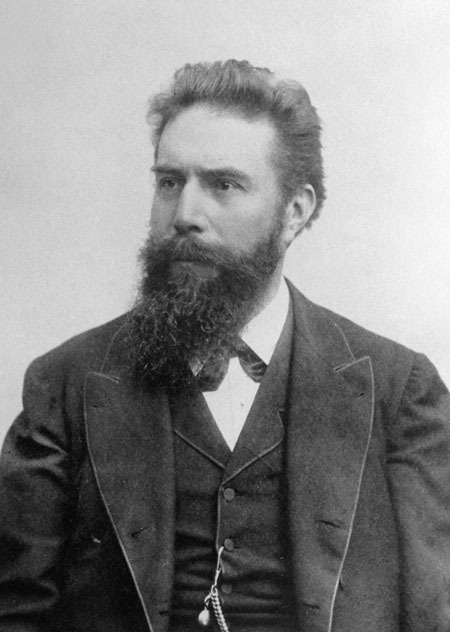 In 1894, while at Würzburg, Roentgen began to investigate the nature of cathode rays. In the 1870s English physicist William Crookes had shown that when an electrical current is discharged within a vacuum tube, negatively charged radiation (cathode rays, later shown to be streams of electrons) is produced and causes the tube’s glass walls to glow, or fluoresce. In December 1895 Roentgen announced his discovery, described physical properties of X­rays, and publicized an X­ray image of his wife’s hand. After 1897 Roentgen paid little attention to X­rays, choosing not to patent his discovery because of his belief that scientific inventions belong to all people. He was awarded the Nobel Prize for Physics in 1901 for the discovery and donated the proceeds of the award to the University of Würzburg. Roentgen taught at the University of Munich, German, from 1900 to 1920. He died on February 10, 1923, at his home near Munich. Roentgen’s identification of X­rays had a momentous impact on the progress of physics research, the development of structural chemistry, and the initiation of important medical practices. The advent of X­rays inspired extensive research. In 1896 French physicist HENRI BECQUEREL discovered radioactivity while performing experiments with fluorescence and photographic plates. MARIE CURIE and her husband Pierre continued Bequerel’s work in 1898 with the discovery of new radioactive substances. In 1912 German physicist Max von Laue showed that X­rays consist of electromagnetic radiation similar to visible light but with a much shorter wavelength. The X­ray experiments of British physicist Henry Moseley, one of von Laue’s students, linked the chemical behavior of elements to their atomic structure. Von Laue’s work led directly to the 1913 development of X­ray crystallography by the English physicists William and Lawrence Bragg; X­ray crystallography is a powerful tool for determining the structure of molecules. British crystallographers Dorothy Hodgkin and Kathleen Lonsdale used the technique (independently) to analyze the structure of complex biochemical molecules and organic crystals. In the 1950s the elucidation of the structure of DNA was attributable in part to the X­ray crystallography work of British physicist ROSALIND FRANKLIN. X­rays proved to have several medical applications. They were first used for imaging bone structure, and they continue to be a valuable diagnostic tool. In the 1960s scientists introduced X­ray tomography, the viewing of soft body tissue by the combination of many X­ray images taken at various angles. The modern version of this technique, used to locate internal abnormalities in soft tissue, is known as computer­assisted tomography (CAT).